Giva is located on Tha Pae Soi 1, which stretches between Tha Pae and Loi Kohr roads. The restaurant is close to the large Dusit D2 hotel, if you're looking for a landmark. You can probably get any tuk tuk driver to take you to the right street. I'm unsure of the exact address. The google map directions I've placed below are to the approximate area on the street, but not the front door, since google has no listing for Giva. The restaurant itself is very small, with a seating capacity of perhaps a dozen. Everything is clean and well kept. The owner, chef, and so employee, Pom, is fluent in English and friendly. He is amenable to diners specifying that they don't want certain items in their food, which will be key for health-conscious raw foodists. It's likely that the ideal low fat raw vegan restaurant has not yet been invented. If you're looking for salads that contain three heads of lettuce, as I often enjoy, then you're not going to find it here. But what Giva does have is tasty, low-toxin, produce-based menu prepared by a talented chef. Since I almost never eat out, I consider it something of a treat to actually have someone else make my food. Many of the menu items may contain raw foods that are not ideal, so it may be wise from the get go to tell Pom what items you don't want, or ask him about the ingredients of a particular dish. You can specify that you don't want such as salt, onions, and garlic, for instance. I'm quite sure that some of what I ate contained condiments that I would normally avoid, such as small amounts of oil and perhaps some dried herbs, but as a rare treat I'm willing to make an exception for them. None of what I ate made me feel ill, which is generally my fist-tier litmus test for raw food restaurants. All the food was delicious and the aesthetically appealing to boot. If you happen to be in the area, you might want to check it out. 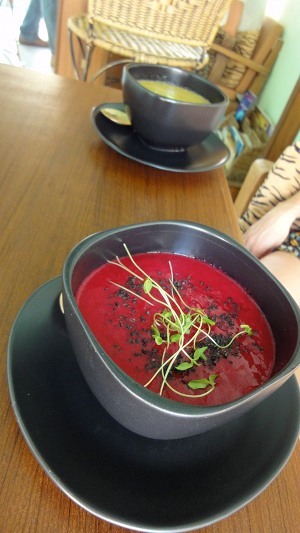 Find more raw food hot spots like Giva. Learn how you can get on a healthy raw food diet.